This is a useful antibody to check that extracts have maintained their CSF status and haven't been activated into interphase. Recombinant full length protein (Xenopus laevis). 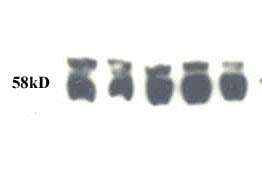 This antibody is thought to bind to a phosphorylated epitope. However, this has not yet been proved, but it does stain in a mitotic specific manner. Our Abpromise guarantee covers the use of ab12212 in the following tested applications. WB Use a concentration of 1 µg/ml. Detects a band of approximately 65 kDa (predicted molecular weight: 68 kDa). AZ44 only blots the Xenopus mitotic form of Plx which we assume to be due to this antibody recognizing a phosphorylated epitope. Publishing research using ab12212? Please let us know so that we can cite the reference in this datasheet.